The H264-2SDI-XMC is an ultra-low latency, quad channel, H.264 encoder on an XMC Mezzanine form factor board. The H264-2SDI-XMC provides a powerful and flexible solution for concurrently capturing and compressing high definition HD-SDI inputs and standard definition PAL/NTSC/RS170 inputs to H.264/MPEG-4 AVC (Part 10) standard. The H264-2SDI-XMC is ideal for time-critical, low latency IP streaming applications as it offers Ultra Low Latency encoding of below 40ms across the entire capture resolution range. The flexible H.264 engine allows low latency encoding of all 4 channels and has a maximum throughput of 1080p60. This allows combinations such as; single channel @ 1080p60, dual channel @ 1080p30, or, quad channel encode of 1x 1080p30, 1x720p30, and 2x PAL/NTSC/RS-170 concurrent encodes. 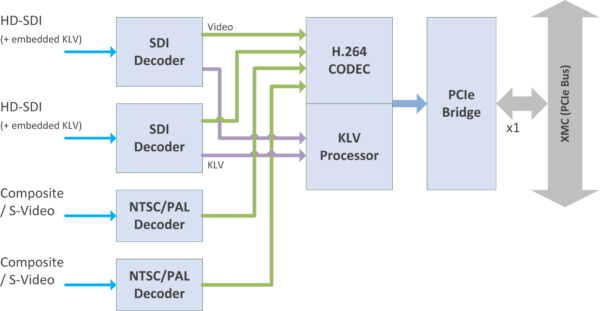 The H264-2SDI-XMC supports extraction of KLV (MISB 0605.3 compliant) embedded data contained within the HD-SDI signal. The video and metadata are synchronized and transferred to the host system over the PC/104-Express bus for processing. The H264-2SDI-XMC is supported by a set of well-documented and established SDKs that minimize development risk and shorten time to market for applications requiring video recording or streaming.